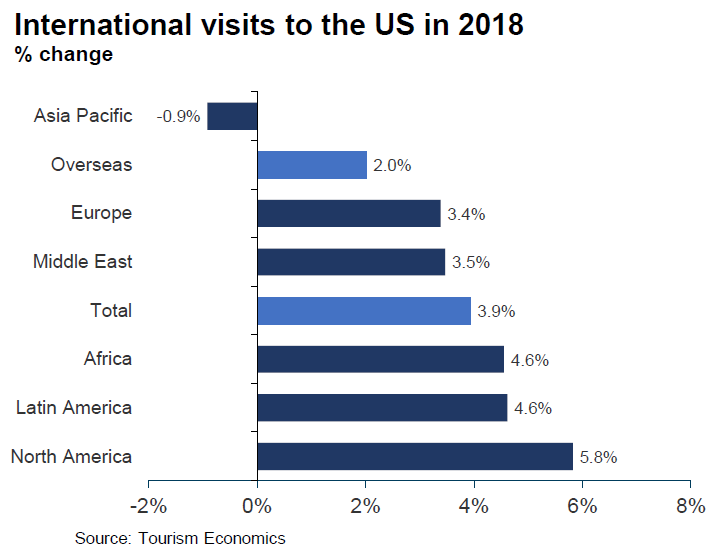 Tourism Economics released an analysis of 2018 international arrival estimates to the U.S. and their view of what can be expected of 2019. Monthly data show slowing demand in overseas arrivals to the U.S., especially in the second half of 2018, leading to a modest growth rate of 2 percent in 2018. They describe the performance as subpar and uneven with Asia posting a 0.9 percent decline, Europe remaining resilient at 3.4 percent growth, and North America leading the arrivals growth at 6 percent. Both Canada and Mexico arrivals grew 6 percent over 2017. Tourism Economics describes the outlook for international arrivals in 2019 as tepid, and consistent with recent monthly trends. The rash of soft economic data suggests the economic booms of 2017 and 2018 that boosted travel are now over and a global economic slowdown is expected for the year ahead. This slowdown combined with a strong U.S. dollar will constrain international travel, and slow growth rates.